If you are like me and want to save money on electricity, you are probably keeping some windows and doors open this summer. And if your dogs are like mine, they love to stick their noses out and catch the scents and see the sites. But if you live more than one story off the ground, there is a danger to keeping your windows open. 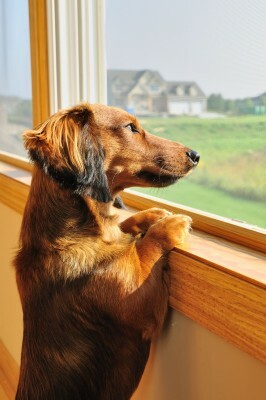 To prevent your pet from falling out of an open window, be sure that your windows are securely screened. For more information on this pet risk, visit the ASPCA.org. This entry was posted on July 17, 2011 at 7:02 am and is filed under Dog Safety. You can follow any responses to this entry through the RSS 2.0 feed. You can leave a response, or trackback from your own site. Frightening, I had no idea this was common. When Dougs was a puppy, I had opened a sash window by pushing it up and whilst on the phone, to my absolute horror saw this small puppy walking along the window ledge outside – he had climbed on the back of the sofa and just got out. My heart was in my mouth as we were upstairs in my bedroom. I grabbed him in with relief and only ever opened the window thereafter so that the gap was at the top where he couldn’t reach. Very lucky escape.